Based on the true-life exploits of notorious Depression-era bank robbers Bonnie Parker and Clyde Barrow, Bonnie and Clyde is recognized as one of the most violent films to come out of mainstream Hollywood. Bonnie and Clyde wasn’t just revolutionary in the way it used violence, it was revolutionary in the way its tone shifted, getting slowly darker. The two fall in love and begin a crime spree that extends from Oklahoma to Texas where they rob small banks with skill and panache, soon becoming minor celebrities known across the country. Both Warren Beatty and Faye Dunaway deliver subtle, strong performances with Gene Hackman along for the ride as Clyde's over-the-top brother Buck Barrow. Bonnie & Clyde" is not a perfect film but it's a highly influential piece of modern cinema that has been imitated but never toped. This is the first time that I have seen the film and I was pleasantly surprised with this action drama that is loosely based on the truth of two lovers on the edge. Warner presents the film in 1.85:1 widescreen at 1080p/VC-1 on a dual-layer BD50 disc. While this is a very old film, Warner has done a fantastic job restoring the print to it's original glory. 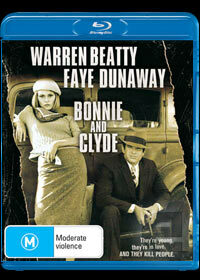 Since no raw audio exists anymore for this film, "Bonnie & Clyde" could not be remastered and is rather monotone at times. For fans of the movie, they are truly going to enjoy this Blu-Ray and it's nice to finally get a decent special edition of this film. Newcomers should definitely give this disc a spin. It's a terrifically inspirational film, fast paced and full of style that the Blu-ray presentation only aides in keeping this memorable film alive and kicking.